Q. Nasidius was one of the admirals of Gnaeus Pompeius Magnus during the Civil War. 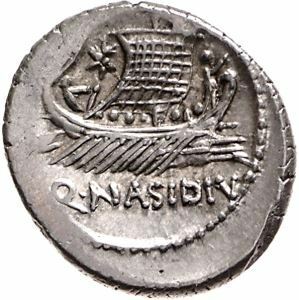 A coin dated to 44-43 BC was struck by him, featuring the head of Pompeius and a trident on the obverse, and on the reverse a ship, with the inscription Q. Nasidius. Gens Nasidia was otherwise an obscure plebeian family. Although none of the Nasidii are known to have held any of the higher offices of the Roman state, a number are known from inscriptions. The nomen Nasidius belong to a class of gentilicia formed with the suffix -idius, which originally developed from surnames ending in -idus, but later came to be viewed as a regular means of forming nomina. It implies the existence of a cognomen Nasidus, but may perhaps be from the more regular Naso, originally signifying someone with a prominent nose. A large family of Nasidii appears to have settled in Africa Proconsularis and Numidia, and in particular the colony at Castellum Elefantum in Numidia.